The Republic of Costa Rica (Spanish: República de Costa Rica) is a country in Central America, bordered by Nicaragua to the north, Panama to the east and south, the Pacific Ocean to the west and south and the Caribbean Sea to the east. 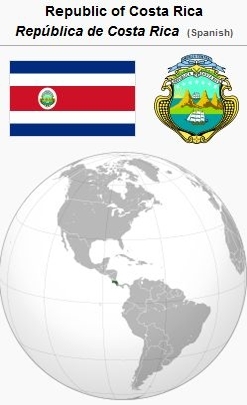 Costa Rica's total area is 51,100 km2 (19,652 square miles) and had an estimated population in 2009 of 4,586,353. In 2011 the following ethnic groups were reported in Costa Rica: 65.8% White / Castizo; 13.65% Mestizo (people of mixed European and Amerindian ancestry); 9.03% Immigrants; 6.72% Mulatto; 2.40% Amerindian; 1.03% Black; 0.21% Asian; and 0.88% other. The majority of whites are primarily of Spaniard ancestry. Roman Catholicism is the official state religion in Costa Rica. 70.5% of Costa Ricans are Roman Catholics, 44.9% of the population are practicing Catholics, 13.8% are Evangelical Protestants (many of them Pentecostal), 11.3% report that they do not have a religion, and 4.3% belonged to another. In August 1961 the Conservative Mennonite Board of Missions and Charities (Rosedale Mennonite Missions) sent two missionary couples to establish a Mennonite witness in Costa Rica, eventually establishing the Convención Evangélica Menonita de Costa Rica. A group of Beachy Amish led by minister Sanford Yoder and several families pioneered a settlement in Costa Rica in 1968. Mennonite World Conference. World Directory = Directorio mundial = Répertoire mondial 2012: Mennonite, Brethren in Christ and Related Churches = Iglesias Menonitas, de los Hermanos en Cristo y afines = Églises Mennonites, Frères en Christ et Apparentées.Kitchener, ON: Mennonite World Conference, 2012: 20. Wikipedia. "Costa Rica." 2010. Web. 5 June 2013. http://en.wikipedia.org/wiki/Costa_Rica. Thiessen, Richard D. "Costa Rica." Global Anabaptist Mennonite Encyclopedia Online. June 2013. Web. 23 Apr 2019. http://gameo.org/index.php?title=Costa_Rica&oldid=122250. Thiessen, Richard D. (June 2013). Costa Rica. Global Anabaptist Mennonite Encyclopedia Online. Retrieved 23 April 2019, from http://gameo.org/index.php?title=Costa_Rica&oldid=122250. This page was last modified on 20 May 2014, at 06:29.